Good evening everyone, as promised here is Part 1 of the Core Training posts. This segment is Pilates inspired. Lie on your back and on an inhale lift your chin towards your chest at the same time gently pulling your right leg into your chest placing your left hand on your right knee and the right hand on your right ankle and straightening the left leg. Your back should remain on the mat at all times, keep your shoulders relaxed and your elbows wide. Gently tug on the bent leg twice and switch legs and hand position. Lie on your back with your head and upper body rounded and off the mat, hugging your knees into your chest with your hands on your ankles. Inhale stretch and lengthen your legs in front of you at the same time reaching your arms back by your ears. Exhale and circle your arms around by your sides at the same time using your abdominals to pull your knees into your chest and hold for a few seconds. Repeat the exercise for the number of reps.
From the position above bring your right leg straight towards the ceiling grabbing your ankle or calf with both hands extend left leg extended straight at a 45 degree angle, hovering above the mat. Keep your shoulders down. Inhale and pull your raised straight leg in towards, pulsing it twice, exhale and quickly switch legs, like scissors. Repeat the exercise with the left leg. Lie on your back, with your head resting in your hands, your head and upper body rounded off the mat, extending both legs towards the ceiling. Squeezing your inner thighs together. Squeeze your glutes and lower your legs towards the floor, as far as you can without arching your back off the mat. Lie on your back with your hands behind your head, bring your knees into your chest. Keep your right knee bent into your chest and extend your left leg away from your body. Inhale to prepare, exhale and rotate your torso towards the opposite knee and switch sides. A few tips to remember, keep your abs engaged, lift from your abdominals, keep your shoulders down and breathe. 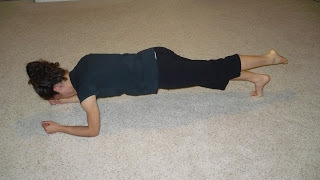 Get into the plank position on your forearms, keep abs pulled in. Lift your right leg to hip level, and move it out to the right. Keep the right leg lifted and bring it back to the center and cross over the left leg. Switch legs and repeat. Perform this routine every other day. 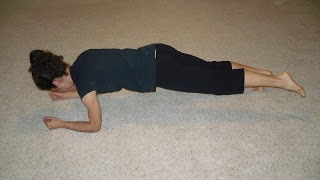 Include the plank variations from my previous post to really work your core deeper. Let me know what you think.